In the SCA2RS project, sponsored by FRAE and in cooperation with ONERA, SAGEM and CNRS-LAAS, ROBOSOFT has developed a simulator which manages the behavior of all the actors in a rescue mission scenario, after a natural disaster. The actors are groups of survivors, and aerial drones, land robots and manned helicopters in charge of seeking and rescuing the survivors. The simulator comes with two user interfaces: the “Master of the World” and the “Operator”. 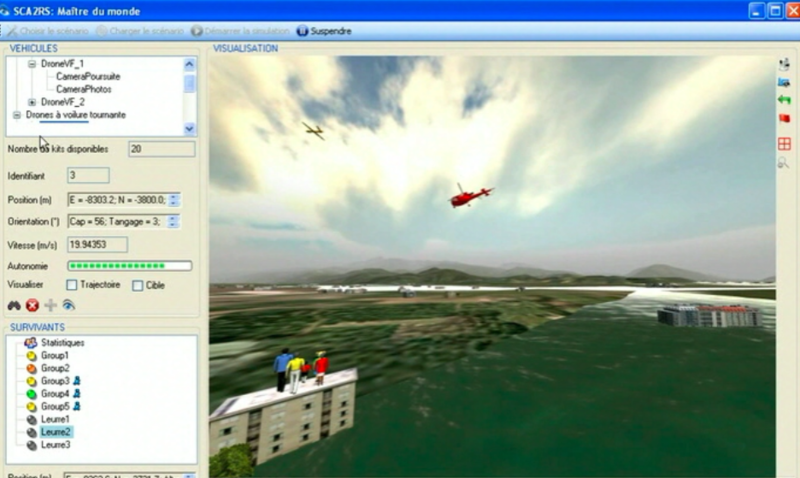 The “Master of the World” interface defines the actors of the simulation and acts on the environment; a realistic 3D view of the environment is also available. The “Operator” interface is used to view pictures coming from the drones and confirm the automatic detection of survivors. This simulator is the realistic reflect of the fleet’s intelligence developed by our partners in their planning algorithms.